The BID Loyalty card is a special card that provides the bearer with a wide range of offers and deals that our BID members have pledged. Simply shown your card to the proprietor and quali=fy for some great discounts throughout St Austell town. 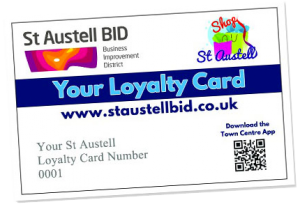 St Austell Loyalty Cards are FREE TO EVERYONE. Simply complete the form and we will pop one in the post to you without delay.